Memories of a Very Early Gig : was 'Hesperus' ever played live by Procol Harum? 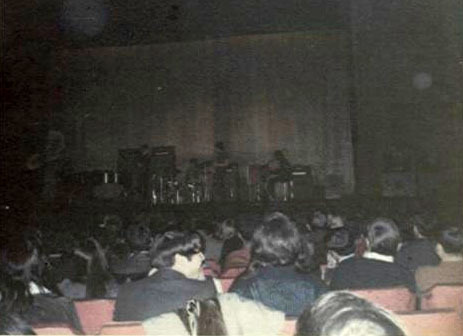 March 12th or 13th, 1969: This was the first time I'd seen the band. They played a gig at the Loew's Jersey theatre in Jersey City, NJ, and opened up for John Mayall's Bluesbreakers (who had Mick Taylor with them on guitar). This was either a Wednesday or a Thursday night gig, and right before their weekend gigs at the Fillmore East in NYC (where they headlined over The Collectors and Pacific Gas & Electric). Jersey City is right across the river and about a ten-minute subway ride, from Manhattan. I went to see them in Jersey City and the next weekend at the Fillmore in NYC. I had some pix of them from this show: one of them was a great close-up of Robin. I looked for them, and unfortunately, the only one I can now find was taken from my seat, and shows Gary, David, BJ, Robin and Matthew silhouetted against the stage backdrop. Matthew wore what looked like a old black military jacket with reversed chevrons on the left sleeve. He used two Leslie 147s with the Hammond. Robin and David used Marshall stacks. Robin used a goldtop Gibson Les Paul, and David a Gibson EB-3. BJ's kit had some artwork on the bass drum. I don't think I ever saw it after these tours in '69. But when I got my copy of the book, Beyond the Pale, I was surprised to see it pictured in the book (fourth page of photos: Chris and Robin playing on the platform of a train station). It's the same one, exactly -- a landscape with a halo of stars, and the band's name in the top center. I believe they played about 45 minutes to an hour. And they blew Mayall off the stage. Don't remember the setlist, but there was material from A Salty Dog and Shine on Brightly, and what I now know was Stoke Poges (aka Chelsea's Tune). They opened up with Shine on Brightly, as was their wont back in those days. And I think I remember them doing Wreck of the Hesperus, as well. I do remember that Matthew did the vocals on more than one song. One was Pilgrim's Progress. I wasn't into chemical refreshment and went to all my concerts completely straight, so hopefully, what memories are still there of these shows (hopefully) are unaltered by perception or age as well. I went with a friend of mine who is still my best friend thirty-plus years later. Although he was into PH at the time as well, he hasn't been for a long time now , and I called him a little while ago about this. He confesses to not remembering whether or not Hesperus was played. It could be that Matthew's other vocal was on In Held ... but the thing that sticks in my mind is that, on the night in question, PH were an opening act -- and I don't think I remember them doing IH'TII until I saw them headlining. I'd love to get the songlist from that show. This past March, at a 31st anniversary reunion of a really good high school band I played in, we worked up an arrangement of A Salty Dog, using two keyboard players (one on Yamaha CS1X strings, one on piano) as well as an authentic bosun's whistle and ship's bell. It wasn't Edmonton, but I was pleased at what the mains mix sounded like. If BtP ever need (or would consider inviting) a bass-player and longtime fan who knows a lot of the Procol repertoire for any of the Palers' Band events, I'd fly myself out to do it.